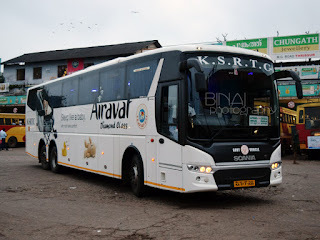 During my visit to Chennai in April, I had decided to make a trip to Coimbatore to capture a particular bus (heights of madness, you may say). I was planning to make a quick trip to Coimbatore for quite some time now. The polling day (assembly elections of Karnataka) was an ideal opportunity for me. As soon as I zeroed in on the date, I started hunting for tickets. The Conti "Asia Bus" was high up on my priority list - but I wanted to try that in the Coimbatore-Bangalore side - but they did not offer online booking for that service. 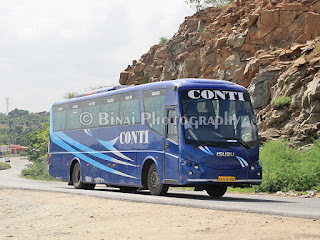 Left with no choice, I decided to book my journey to Coimbatore in Conti Travels. I booked through a third party website and pocketed a small discount as well. Getting a return ticket turned out to be a big task - for some reason, all night services were sold out for that day! I was shocked - non even non-ac buses were available! Left with no options, I booked a ticket to Mysore by KaSRTC. My bus was late in the night. I normally do not prefer traveling by late night buses - for the simple reason that I sleep quite early on normal days. I was sleepy as I walked to the auto stand near my house. There was only one auto there, and the driver was having his dinner then. I asked him if he'll take a trip after food - he replied affirmative. So decided to wait for him to finish. He finished quickly, and started off with me. The rick was slow - it was crawling, but then, I had no hurry. The driver left me at Madiwala by around 2235hrs - he did not demand a particular rate, so just paid the an amount that is just more than the meter rate. I headed straight to the Conti travels office - the guy saw my ticket and replied that the bus would come at 2300hrs. I walked around a bit - it was drizzling, and hence I returned to the office and decided to rest my weight on a chair there. I was sleepy - beyond control. Tuned in to some music for some time. The clock ticked past 2300hrs, but no sign of the bus. In the meantime, there was a steady stream of buses towards Chennai - Greenline, Sharma, SPS, etc kept going. There was no sign of my bus - other passengers in the office got a bit restless and they started questioning the office guy there. He replied that the bus has left Kalasipalya, and is getting delayed due to block. I decided to remain outside the office. 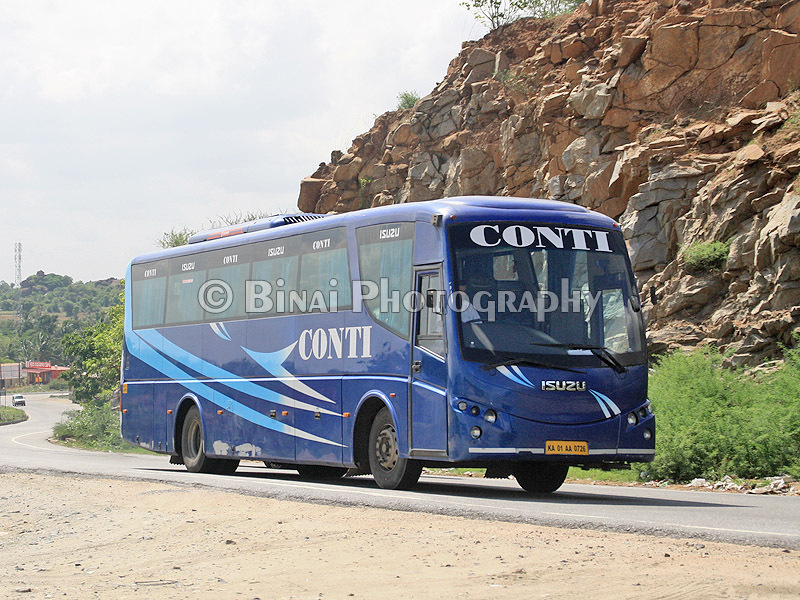 At around 2315hrs, the old Isuzu of Conti Travels rolled in. Conti has been using their Isuzu to run special services during weekends - so did not really bother. But the guy in the office started shouting "11pm Volvo". Are you kidding me? Volvo? I re-confirmed, and slowly trudged towards the bus. I confirmed again with the drivers - they replied that the Volvo had gone for service and did not return in time and hence the Isuzu! Now came another confusion - how will they adjust the seats? I did not want to waste my precious processor capacity - so just discarded the confusion and walked inside. The bus was chilling inside - the interiors looked well kept as well. As I got in, the driver asked my seat number, and gave me a boarding pass after collecting my e-ticket. A bottle of water was also handed over! I headed straight to my seat (#26), which was now two rows from the back. The bus is a 36 seater, all semi-sleeper seats. As I got in, I understood that the bus wasn't full. Heard from a passenger in the nearby row that they had merged their non-AC and AC services!! They were ruing about the downfall in quality of services. The bus started off at 2324hrs. There was no blanket at my seat. Soon after the bus started rolling, the attendant came around and supplied blankets to the new passengers. My adjacent seat was empty. The seats were fairly comfortable - the recline was good. I spotted the Kallada EKM-Hyderabad Volvo just as we crossed Silk Board - that was amazing timings. I slowly drifted to sleep - I noticed that we did not take the flyover to Electronic City. The bus did not have great pickup - it made a lot of noise as it starts from stop. But the engine was fairly silent on the run. The AC was very efficient as well. The bus reached Hosur at 0005hrs - one passenger got in, but my adjacent seat remained empty. I decided to make full use of the opportunity now. In the meantime, I overheard the second driver talking to another passenger about the political unrest in TN. 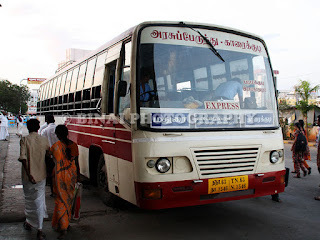 The passenger wanted to be dropped at Sathyamangalam, but the driver replied that the drop would depend on the condition that night - the passenger did not protest. The bus waited at Hosur for some unknown reason. We started only at 0012hrs. I slept quickly after that. The bus pulled into Rajabhojanam restaurant just before Thoppur, at 0210hrs - lights were switched on. I got off the bus, took a short stroll and remained outside till the crew came back. We started again at 0222hrs. I slept soon after we crossed Thoppur toll. The AC was just right, the blanket was big enough and the seat was comfortable enough - perfect recipe for a nice sleep. All I missed was a pillow. I woke up as the bus stopped at Sathy for dropping a passenger - 0457hrs. It was a brief stop - just stop, drop, and go. The drivers did a good job in the Thoppur-Sathy section. I was hoping to reach Coimbatore by 0530 - that seemed impossible already. I slept for some more time. As I woke up, I saw Roadlink and SPS Sleepers overtaking us - I continued my sleep. The bus pulled into a fuel station at Ramakrishnapuram (near Ganapathy, in Coimbatore) at 0648hrs. The refueling was quick - we got moving at 0657hrs itself. The Sathy-Ramakrishnapuram run was awfully slow. 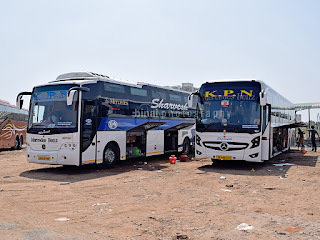 I spotted a couple of KPN buses in a fuel station near Ganapathy as we continued towards the city. I was finally dropped outside the Omni Bus Stand in Coimbatore at 0704hrs - more than 90 minutes past the scheduled arrival time! End notes: The bus, KA-01-AA-0726, had about 5.6 Lakh kms on the odo. The exteriors looked battered, but the interiors were in good shape. There was occasional rattles from the underbody. The seats were clean and well kept. The blanket was fresh. The interiors smelled foul - they could've used an air freshener. The crew were well behaved - they talked typically like a Coimbatorean - Nostalgia! They showed no signs of picking speed or atleast trying to make it to Coimbatore on time. But then, there were some political trouble in TN at that time - so not sure if the bus was detained anywhere during the night. The end-to-end run took 7h49m - surely high for the distance, especially for a night bus. I was terribly disappointed about the replacement as well - I booked the service only to try their Volvo 9100 "Asia Bus" - but ended up in an Isuzu. Not that the Isuzu was bad, but did not meet my expectations. Will I take this service again? I doubt. Might take it once again just to try their Volvo. This was the 12m Isuzu ? Do you have any pictures of the 12m Isuzu owned by any operators?